What made Urban Decay a household name for beauty junkies everywhere was their line of 24/7 glide-on pencils. 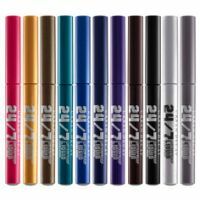 They've expanded their line to include other products which most recently includes the 24/7 Waterproof liquid liner. First off, this new liquid line TRUMPS the old UD liners that came in a round "genie" pot, but lacked the long wear and waterproof capability. The new design also fixes the ...read moreirritability many had with trying to get color from the sides or bottom of the pot. The color "siren" by far is my favorite so far with its gorgeous rich dark teal-green color. I hope that UD comes out with more colors after these liners prove success in a market where waterproof liners are making a big splash with competitors like MAC, Stila, and Make Up For Ever just to name a few. My biggest peeve of this line is the brush. It may seem thin at first, but it's made soft, thin bristles and may likely clump after continued use. I hope that UD changes this in the future to a much firmer felt tip. Remember to SHAKE this very well before use to get the maximum pigmentation! $18 each. This super-thin liner is a winner in my book. It gives great coverage/pigmentation, especially in the black shade. It's easy to apply and you have a good amount of control with it. It definitely stays put, so make sure you draw a line where you want it! This is the kind of liner that you can wear for a night out on the town, or through an 8-hour work day. I'm especially fond of the travel size that I have. I love everything about this liquid liner. The thin, flexible brush allows you to create a thin or thick line and the consistency is thin but pigmented enough to look less harsh than other liquid liners. You can use a pencil liner first to make it easier to draw a straight line.